HomeEditorialPresident Koroma at the India-Africa Summit: Will Sierra Leone benefit economically? Photo: President Koroma of Sierra Leone, along with over forty African heads of state is in New Delhi, India. He is attending the third India-Africa Summit (26 -30 October 2015) which brings together, one continent and a vast Asian nation with a rich tapestry of shared history, vision and ambition, to discuss trade, security and everything else under the sun. “Today, the heart beat of 1.25 billion Indians and 1.25 billion Africans are in rhythm,” Indian prime minister Modi told African leaders at the summit. But there ends the commonality between India and Africa. Today, India is not only aspiring to become the second most powerful economy in the world after China by 2020, but has shown in the last ten years that it has the global competitive strength to build and transform itself from a predominantly agricultural economy to a high-growth manufacturing superpower, driven by huge investments in education, skills development, innovation, science, research and development. Will president Koroma return to Sierra Leone with a briefcase full of signed investment agreements? Speak with most African leaders present at the summit, including president Koroma and they will tell you that they too have a vision for their countries, in particular to achieve middle-income status by 2030. But the key question is; what are they doing to achieve this vision? What building blocks is president Koroma putting in place in Sierra Leone to ensure that by 2030 Sierra Leone can become a middle-income earning nation? Before we answer this question, let us take a look at the India-Africa economic equation. Is there a balance? India’s population is roughly about the same as that of the entire African continent at about 1.25 billion respectively. India’s main economic sectors are computer software, petro-chemicals, agriculture (employing 49% of the country’s workforce), textiles, steel, transport equipment, machinery, leather, cement, construction, chemicals, and jewellery. 24% of India’s population live below the poverty line, compared to Africa’s 65%. Unemployment in India stands at 3%, compared to Africa’s estimated 60%. India’s GDP is $2.382 trillion, compared to Africa’s US$2.39 trillion; India’s GDP Per Capita is $2,004, compared to Africa’s US$2,320; India’s GDP Growth is 7.3%, compared to Africa’s 3.5%; India’s Labour force of 502.3 million earning an average of $1.46 per hour, compared to Africa’s average daily income of about $1.75. Annual average household income in India is $6,671, compared to Africa’s $800 a year. India’s total exports of $464.2 billion goes mainly to the EU and USA, whilst total imports valued at $590.6 billion is largely made up of crude oil, gold and precious stones, electronics, engineering goods, chemicals, plastics, coal and ores, iron and steel, vegetable oil. And these come from China, EU and Saudi Arabia. Although India’s trade with Africa is quite insignificant, China and India are increasingly becoming important trade partners for Africa, with 12.5% of Africa’s exports going to China, and 4% to India. Africa accounts for 5% of China’s imports and 8% of India’s respectively. According to the latest IMF report on the Sub-sahara African economy (Regional economic Outlook 2015); “In recent years the sub-Saharan African region has experienced strong real GDP growth and substantial trade integration. However, growth in sub-Saharan Africa’s trade volumes has not kept up with growth in the volume of global trade during this period and its trade imbalances have begun to rise in recent years. “Economic activity in sub-Saharan Africa has weakened markedly. To be sure, growth—at 3¾ percent this year and 4¼ percent in 2016,” says the IMF report. India is looking to captivate a bigger slice of the African market, with the Chinese already controlling huge percentage of the continent’s economy. So how do the Indian’s see their chances? The Economic Times of India had this to say today; “The summit’s inspiring logo features the African lion and the Indian lion merging along with our two landmasses that were once conjoined but now separated through geological drift. The imagery of Africa and India teaming up with courage and boldness to be “on the prowl” signifies a supreme confidence and optimism that formerly downtrodden, colonised and racially discriminated peoples have an unstoppable momentum today. “India’s pulling power and appeal for Africa have risen over the past year thanks to the higher economic growth trajectory and international standing earned by Modi. With China no longer booming, the contrasting glow on India looks more attractive to Africans who are trying to cope with the sharp slowdown in mineral exports to China and nagging doubts about China’s ability to keep investing in and aiding Africa. “As Modi’s ‘Make in India’ takes off, India could be the next big consumer of the strategic minerals and commodities which Africa has in abundance. It seems the Indians are not sitting on their laurels. They have even got the African leaders trading their rich and colourful African attire for the Indian caftans and waistcoats, popular worn by the Indian middle class. 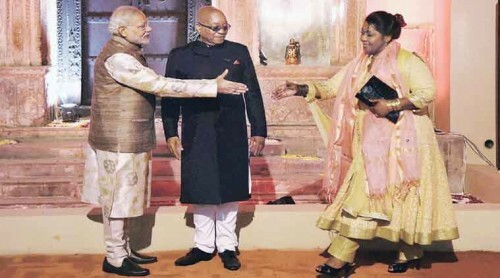 According to India media reports before the summit: “Prime minister Narendra Modi has made a mark with his personalised diplomacy across continents, but he will take it to altogether another level when he hosts a dinner later this month for top African leaders, all of them dressed in his trademark Modi jackets. 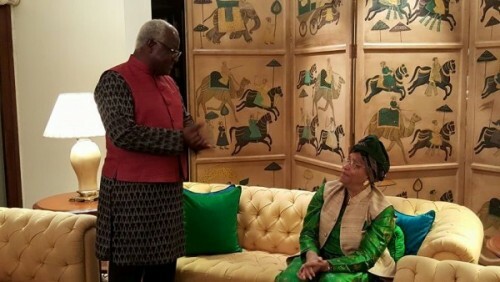 So what did president Koroma tell the Indians that could inspire their investors to board flights to Sierra Leone in search of lucrative investment opportunities; and was he convincing? “Africa is inspired by India as a great model of technological advancement, research and development,” said Koroma. President Koroma also said that Africa seeks to nurture this inspiration in harnessing the continent’s resources for growth, stability and development, saying that Africa is ready for business, and prepared to build synergies for trade and investment. “We seek a win-win partnership based on public sector facilitation and private sector centrality,” he stressed. Hardly the killer blow from a president who says that as chief executive of Sierra Leone, he is running the country like a business. It seems the president forgot to give five key reasons why the Indians should come to Sierra Leone to invest and not Rwanda or Liberia. Koroma’s sales pitch was lacklustre and uninspiring. Perhaps he forgot about the purpose of the summit and why he was attending. 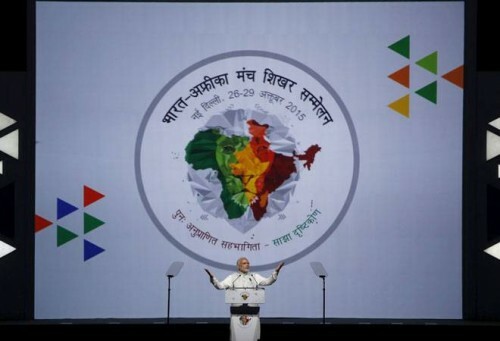 Prime minister Narendra Modi on the other hand was clear in his pitch for Africa’s business. “India’s development priorities and Africa’s lofty vision for its future are aligned.” He said that both sides are two bright spots of hope and opportunities in the global economy. Prime Minister Modi, who was speaking at the inaugural ceremony of the third India-Africa Forum Summit, said India is honoured to be a development partner for Africa. “It is a partnership beyond strategic concerns and economic benefits. It is formed from the emotional bonds we share and the solidarity we feel for each other. In less than a decade, our trade has more than doubled to over 70 billion dollars. India is now a major source of business investments in Africa. Today, 34 African countries enjoy duty free access to the Indian market. “African energy helps run the engine of the Indian economy; its resources are powering our industries; and, African prosperity offers growing market for Indian products,” said Prime Minister Modi. “India has committed 7.4 billion dollars in concessional credit and 1.2 billion dollars in grant since the first India-Africa Summit in 2008. It is creating 100 capacity building institutions, and developing infrastructure, public transport, clean energy, irrigation, agriculture and manufacturing capacity across Africa,” he added. He pointed out that nearly 25,000 young Africans have been trained and educated in India in the last three years and said that they are the 25,000 new links between us. The Prime Minister said the fabric of this world is richer because of the 54 sovereign flags of Africa. “Today, their brilliant colours have made Delhi the most special place in the world. To the 41 Heads of State and Government and the other eminent leaders; to the hundreds of senior officials, business leaders and journalists from Africa, I say this: we are deeply, deeply honoured by your presence today,” said Prime Minister Modi. “To our visitors from the land where history began, humanity grew and new hope rises; From the deserts of the north, where the glory of human civilization shines through the shifting sands of time; From the south, where the conscience of our age has been forged – from Mahatma Gandhi to Albert Luthuli to Nelson Mandela; From the shores of Atlantic that has been at history’s tragic crossroads and now at the frontiers of many successes; From our neighbours on the resurgent east coast; From Africa’s heart, where Nature is generous and culture is rich; And, from the sparkling gems of island states; a very warm embrace of welcome and friendship from India,” he added. Asserting that it is not just a meeting of India and Africa, Prime Minister Modi said the dreams of one-third of humanity have come together under one roof today. “Today, the heart beat of 1.25 billion Indians and 1.25 billion Africans are in rhythm,” he added. Prime Minister Modi further said India and Africa are among the world’s oldest civilisations. “We are each a vibrant mosaic of languages, religions and cultures. Our histories have intersected since ages. Once united by geography, we are now linked by the Indian Ocean. The currents of the mighty ocean have nurtured the ties of kinship, commerce, and culture through centuries. Generations of Indians and Africans have travelled to each other’s land in search of their destiny or by the force of circumstances. Either way, we have enriched each other and strengthened our ties,” said Prime Minister Modi. “We have lived in the long shadow of colonialism. And, we have fought for our liberty and our dignity. We have struggled for opportunity, and also for justice, which, the African wisdom describes, is the prime condition of humanity. We have spoken in one voice in the world; and, we have formed a partnership for prosperity among ourselves. We have stood together under blue helmets to keep peace. And, we have fought together against hunger and disease. And, as we look to the future, there is something precious that unites us: it is our youth. Two-thirds of India and two-thirds of Africa is under the age of 35 years. “And, if the future belongs to the youth, then this century is ours to shape and build,” he added. The Prime Minister emphasized that Africa’s modern strides are catching the attention of the world. “The continent is more settled and stable. African nations are coming together to take responsibility for their development, peace and security. African struggles and sacrifices are upholding democracy, combating extremism and empowering women. Women now constitute around 20 percent of the elected Members of Parliament in Africa,” said Prime Minister Modi. “To one who has played a role in that, President Sirleaf, I extend our best wishes on your birthday today,” he added. 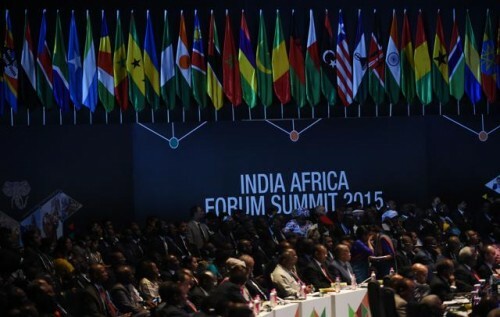 Prime Minister Modi further said Africa’s economic growth has gathered momentum and has a more diversified base. “African initiatives are replacing old fault lines with new bridges of regional economic integration. We see many successful examples of economic reforms, infrastructure development and sustainable use of resources. They are turning adrift economies into dynamic ones,” Prime Minister Modi said. “Four hundred thousand new businesses were registered in Africa in 2013; and, mobile telephone now reaches 95 percent of the population in many places,” he added. 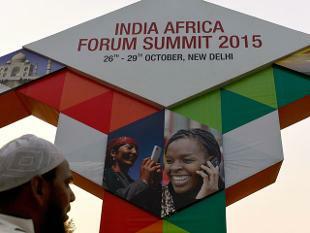 Prime Minister Modi said Africa is now joining the global mainstream of innovation. “The mobile banking of M-Pesa, the healthcare innovation of MedAfrica, or the agriculture innovation of AgriManagr and Kilimo Salama, are using mobile and digital technology to transform lives in Africa. We see strong measures that are radically improving healthcare, education and agriculture. Primary school enrolment in Africa now exceeds 90 percent. And, across its magnificent landscape, Africa is setting standards in wildlife conservation and eco-tourism. Africa’s sports, art and music delight the entire world,” said Prime Minister Modi. “Yes, Africa, like the rest of the developing world, has its development challenges. And, like others in the world, it has its own concerns of security and stability, especially from terrorism and extremism. But, I have confidence in African leadership and the African people to rise to those challenges,” he added. The Economy of India is the seventh-largest in the world by nominal GDP and the third-largest by purchasing power parity (PPP). The country is classified as newly industrialized country, one of the G-20 major economies, a member of BRICS and a developing economy with approximately 7% average growth rate for the last two decades. India’s economy became the world’s fastest growing major economy from the last quarter of 2014, replacing the People’s Republic of China. The long-term growth prospect of the Indian economy is moderately positive due to its young population, corresponding low dependency ratio, healthy savings and investment rates, and increasing integration into the global economy. The Indian economy has the potential to become the world’s 3rd-largest economy by the next decade, and one of the largest economies by mid-century. And the outlook for short-term growth is also good as according to the IMF, the Indian economy is the “bright spot” in the global landscape. India also topped the World Bank’s growth outlook for 2015-16 for the first time with the economy having grown 7.3% in 2014-15 and expected to grow 7.5-8.3% in 2015-16. India’s economic prospect and outlook for the future is impressive. But can Africa ride on India’s back in search of her dream of achieving middle-income status by 2030? After all, did Prime Minister Modi not say that “India’s development priorities and Africa’s lofty vision for its future are aligned, and both sides are two bright spots of hope and opportunities in the global economy”?